LAMER, Yap — Yap Catholic High School concluded the first semester of school year 2018-2019 on December 14, 2018 after three days of midterm exams. The school community has been hard at work for the second semester since January 3, 2019. On January 10 & 11, 2019, the school gathered at the chapel to award students with perfect attendance and academic honors from the previous quarter. Yap Catholic High School alum, Domclancy “Jun” Tiliwebug (Class of 2014), is the first YCHS graduate to complete his undergraduate education and earn a bachelor’s degree. On May 6, 2018, Domclancy received his diploma for successfully completing his Bachelor’s in Science degree in Electrical Engineering from the University of Portland. He plans to stay in Portland, Oregon to gain work experience, but he hopes to one day return to Yap to help his home islands. Yap Catholic High School completed its Third Quarter on March 9th . During the Third Quarter 51 students received Perfect Attendance Honors for being at school and on time every single day. The overall attendance rate continued to be high at 99.2%. In addition to Perfect Attendance Honors, 55 students earned Academic Honors. Over 300 members of the community gathered at the YCHS campus on Saturday, May 27th to witness the graduation of the sixteen members of the Class of 2017 during the 4th Commencement Exercises. Salutatorian Francis Yarofalyango gave the welcoming address followed by the student address given by Valedictorian Natasha Loochaz in which she focused on the importance of learning from mistakes, never giving up, and being willing to seek help from others. 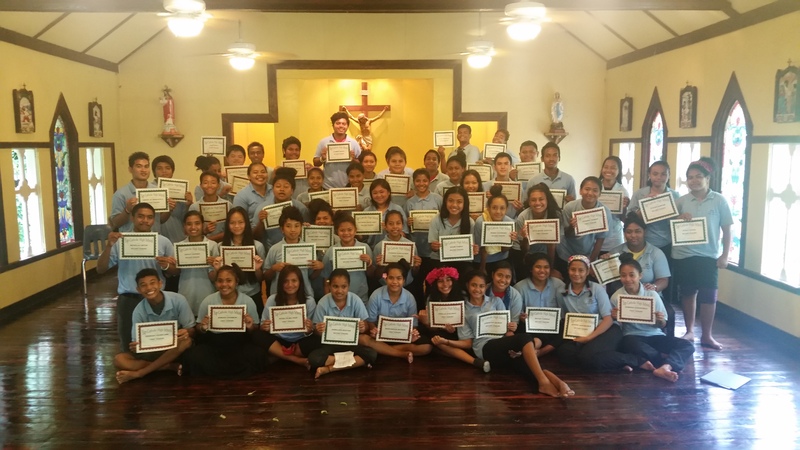 The students at Yap Catholic High School continue to work hard both inside and outside of the classroom as they enter the final quarter of the year. Outside of the classroom, our students have been busy preparing for the annual Prose and Poetry event, practicing with their basketball teams, and updating the student-led STEM/ Robotics Club. A group of our student leaders also raised over $900 for the school by supporting their Yapese culture at the Yap Day celebrations. The 2016-2017 school year began with a strong first quarter as we welcomed our new teachers, transfer students, and the incoming Class of 2020. Yap Catholic High School is pleased to report that we have our highest enrollment numbers (81 students) since the founding of our school, including a full freshman class of 24 students.